Seven years after his neon-lit Spring Breakers took us all on a wild and raunchy trip, Harmony Korine is back with what looks like the perfect followup, The Beach Bum. Starring Matthew McConaughey in the sort of stoned-out, lazy role that were a big part of his cinematic persona for years, the film centers on Moondog, a sort-of poet laureate for the smoked-out set. Just one look at the glowing colors and hazy aura tells you that Korine is pulling from the same mindset that inspired Spring Breakers, while the cast also speaks volumes: Snoop Dogg, Martin Lawrence (as Captain Wack!!! ), Jimmy Buffett, Isla Fisher, and Zac Efron co-star, joined by Jonah Hill and Stefania Owen. 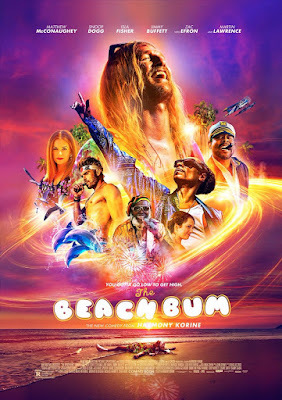 Here's the synopsis: “The Beach Bum” follows the hilarious misadventures of Moondog (Matthew McConaughey), a rebellious rogue who always lives life by his own rules. Co-starring Snoop Dog, Zac Efron, and Isla Fisher, “The Beach Bum” is a refreshingly original and subversive new comedy from director Harmony Korine (Kids, Spring Breakers). The Beach Bum hits theaters on March 22nd.